North American Development Group plans to develop Palm Court Tower, a $100 mil, 30-story luxury residential tower featuring 350 luxury residences at the site, located at 440 E. Van Buren St. Slated for completion in 2020, Palm Court Tower is being designed by Phoenix-based Will Bruder Architects & Forum Studio. Construction of the Tower is set to begin in late 2018. When complete, the luxury residential tower will be the second tallest residential building in downtown Phoenix. Rising 22 stories above the swimming pool terrace on the roof of the six-level parking garage, the residences will range from modest studios to three-bedroom units. Eight different floor plans will provide for innovative and functional contemporary living with a variety of unit sizes ranging from 500 sf to over 1.3k sf. The community will feature a garden entry, amenity level with swimming pool and fitness facilities, residential parking and services. 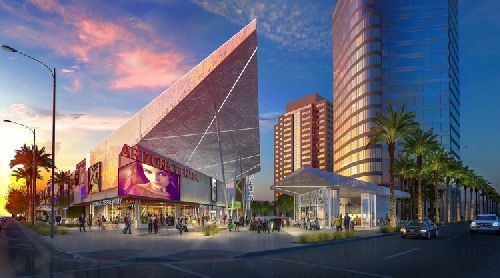 This is just the latest phase in the ongoing $25 mil makeover of the Arizona Center acquired by Parallel Capital Partners and Angelo Gordon & Co in late 2015. Renovations began in 2017 with upgrades to enhance interior and exterior common areas. Last month, Parallel announced the completion of phase one in the Arizona Center renovation and plans to add a 200-room AC Hotel by Marriott, a development by Las Vegas-based LaPour Partners. Construction of the hotel is set to begin in 2018.